SORRY, THIS CLASS IS SOLD OUT. PLEASE CHECK BACK SOON FOR OUR NEXT ONLINE PROJECT. Welcome! I'm excited to tell you about our newest online class project. It's been months in the making and when you see all of the marvelous details, you will understand why. 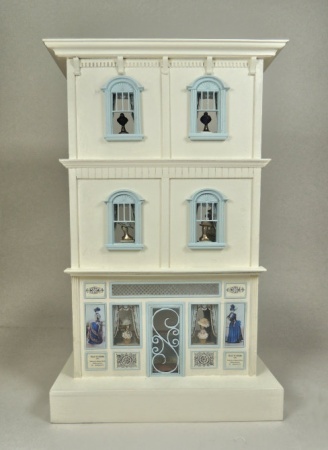 Our new creation is the ultimate French Ladies shop circa 1890. This was the very end of the bustle age, but certainly not the end of the opulence that Paris is well known for. We tried to incorporate that feeling into every part of this project. We begin with a three story building. The beautiful windows are not plastic, but wood. It was actually this window that inspired the rest of the building. I wanted to see if I could make a pretty, detailed window from scratch, rather than using plastic railroad parts. I was very pleased with the results and you will be too. The first floor features beautiful signage, an elegant entrance and a diamond pattern transom window. The soft cream and lovely french blue colors are soothing and elegant. The building is lit with LED chips, which are powered with a special little plug in transformer. No batteries to change out!!! The entire piece stands 9 1/2" tall, and base is 6" across and 5" deep. The first floor is the ladies dress area. A beautiful newly designed settee and coffee and end table provide a place for the customer to sit while viewing the seasons latest styles. There are three costumed mannequins. They wear dresses made from silk. The detailing is amazing but they are quite easy to assemble. Behind the mannequins is a gorgeous triple mirror featuring gold cherubs and fashion plates of the current styles. Tables sit beneath the windows showing hat and collar sets to the people on the street. On every floor, there are beautiful draperies over the windows. They are not fabric, but are three dimensional and look amazing. Be sure to notice the gorgeous staircase going up to the second floor, with it's elegant railing. The ceiling is beautifully embossed and the wallpaper and rugs pull it all together. Under the rugs is wood flooring. The second floor contains the Hat and Corset departments. A beautiful gold mirrored vanity is available to use while trying on the latest hat styles. Rows of hats are on display. 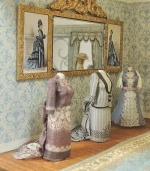 On the other side of the room is the counter containing three mannequins wearing silk and lace corsets. A few silk stocking boxes fill out this display. A beautiful gold leaf chair which matches the settee on the floor below is available in case you need to take a rest before climbing those stairs to the third floor. The third floor is for Jewelry, Toiletries and Shoes. Yes, shoes!!! We have finally figured out how to 3D print the tiniest little shoes and high button boots you will ever see. All you need to do is add paint. The shoes are displayed on their own cabinet which also holds many tiny shoe boxes. Another gold chair is in the shoe department along with the shoe fitter's stool and small floor mirror. There is a tall cabinet on the back wall with matching counter for the jewelry displays, which are also displayed in front of each window. And on the remaining wall is a triple display cabinet filled with tiny toiletry boxes, perfume displays and little perfume bottles. When I do a project like this, I do set out to design a product for sale. I make it the way I would want to see it in my collection. That means that it is not just a building and a few furnishings. It is completely filled with every little item that needs to be there. We want our quarter scale projects to be as complete as the 1/12 scale pieces. Not always an easy task as there are very few ready made accessories in 1/4 scale. But I think you will agree we have created lots of little details in this project. Not only does it need to be complete, it needs to be PRETTY!! Wallpapers, artwork, carpeting, and fabrics are all carefully color coordinated to create a beautiful environment. Not since the Babyhouse for Quarterscale have we done a project this elaborate, with this many different items and materials incorporated. And it comes to you in one kit, for one price. Every shoe, bottle, box, hat, bead, or bauble that you see in the photos is included in your kit. You need only to provide basic tools and paints, and sealers. The electrical system is also included. Be sure to look at the many photos shown below for more details, and if you have any questions be sure to send me an email. We will have to limit the size of the class, and have a shorter than usual registration time in order to finish the kits by the estimated delivery date of September 10. This class is open to all on a first come, first served basis.